In the past (and in many dental offices still today) the only way to fill a cavity was with unsightly metal. Thankfully, with advances in dental techniques and technology, we are able to fill cavities with a tooth-colored resin material that blends in seamlessly with your natural teeth! Tooth decay, or dental caries is the number one most common chronic disease among children in America, and affects adults more than most patients realize. 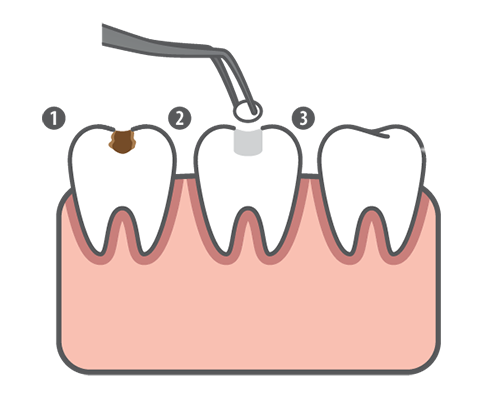 Tooth decay happens when sugar and plaque is allowed to remain on the teeth and turns into acid that breaks down tooth enamel. Don’t let tooth decay go untreated because it will only get worse, and can cause toothaches, infections, and even tooth loss. In children, tooth decay can cause not only oral health problems, but can make it difficult to pay attention and learn. The good news is, tooth decay is entirely preventable. You can prevent tooth decay by minimizing sugary and acidic foods and beverages in your diet, and maintaining a strict oral hygiene routine, as well as your regular visits to Spring Creek Dentistry. We want to help you keep your natural teeth as healthy as possible for a lifetime of happy, healthy smiles. If you have any questions about tooth-colored fillings, or would like to schedule an appointment with your Spring dentist – Dr. Oakley, Dr. Henley, Dr. Miller, or Dr. Wendt – please contact us at Spring Creek Dentistry today at (281) 407-8333 .